Do you think have a slab leak in your San Marino house or San Marino business? 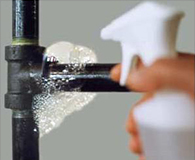 If leaks are not detected and fixed promptly, they can cause severe damage to your home. 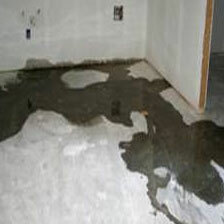 Leaking water can decay and erode the walls, foundation, ceilings and damage flooring. Rust can be caused, as well as mold, wood rot, termites, ants, and even more leaks. Have you noticed your water bill increasing and your water pressure decreasing? That is why we offer our thorough Electronic Leak Detection service. 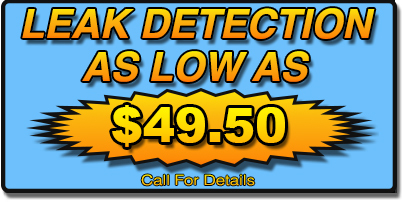 Option One is your local San Marino leak detection experts. We can find your leak fast, and recommend the best way to repair it at an upfront, affordable price... you have our guarantee. What Causes San Marino Water Leaks ? Can We Find Leaks In San Marino CA Even Though You Can't See Them? What Kind Of Leaks Can Be Found In San Marino? Slab leaks are pressurized pipes under a slab of concrete or foundation; found under homes, businesses and industrial facilities built on a slab foundation. Also known as under-floor leakage, or in-floor leakage, on domestic plumbing systems. Domestic water plumbing leaks may be hot water slab leaks or cold water slab leaks. Many of the specialized methods of locating leaks on underground piping are also used in precision location of under slab or in-slab leaks. Electronic leak detection is used on slab leaks to avoid the catastrophic property damage associated with “hunting” for slab leaks with jack hammers and similar demolition tools used by those unskilled in locating leaks without destruction. There are a few ways to detect a slab leak. One is to check if any water is leaking up through the foundation or any settling has occurred. Your San Marino water, gas or electric bills is another way people find out If there is a noticeable increase, you may have an undetected leak somewhere. If the home has deteriorating water lines, then a complete copper pipe replacement (copper repipe) would be advisable. Dripping faucets and water leaks in San Marino waste water and money. The smallest of drips and water leaks around your home should be repaired. A slow drip can waste as much as 15 to 20 gallons of water per day. Many water leaks are easy to fix. Others may require a plumber. Call Option One Plumbing and one of our certified plumbers in San Marino will come by to help. San Marino's responsibility for water meter issues ends on the customer's side of the water meter. The customer is responsible from the meter to the house, including plumbing inside of the house. 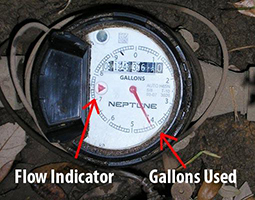 One way to tell if you have a leak is to look at the small triangle on your water meter called the flow indicator and if it is spinning while all the fixtures in the home are in the off position, you have a leak. Call Option One plumbing, your local #1 neighborhood plumber to call when you have a leak on the water meter. Option One Plumbing are experts in the latest leak detection technology in California. You can count on us to quickly find leaks in your San Marino home, make repairs as necessary with full disclosure of price, and never at an unnecessary cost to you. Fast, affordable and honest plumbers in San Marino, that is Option One.